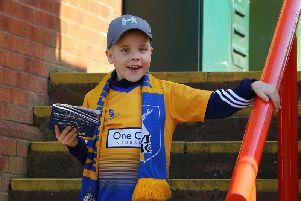 Could history be about to repeat itself for Mansfield Town? Mansfield Town's Division Three Championship presentation in 1977. Left to right. Back row; I. McDonald, I. Wood, R. Arnold, E. Moss, K. Bird, I. McKenzie, C. Foster and B. Foster. Front row; G. Clarke, R. Cooke, K. Randall, G. Hodgsom, P. Morris. P. Matthews and B. McEwan. If you’re a big believer in omens, then this one might be for you. Mansfield Town put four goals past Port Vale on Tuesday night to maintain their promotion challenge in style. This weekend, they will host Chesterfield in a hotly-anticipated local derby. Nothing remarkable in those facts, you might think. But consider this. The last time Stags scored four goals at Port Vale was Easter Saturday 1977. Having done so, they went on to win the Division Three title. But that’s not all. Their next match following that win at Port Vale 40 years ago?